Although entrapment of the sural nerve is a rare condition, the resultant pain can be debilitating for patients. A thorough knowledge of the trajectory of the nerve is essential for establishing a diagnosis, as well as for treatment. Anatomy: the sural nerve is a sensory nerve made up of collateral branches off of the common tibial, and common fibular nerve. High in the popliteal fossa, the sciatic nerve divides into its two main branches on route to serve the leg, namely the tibial nerve, and the common fibular nerve. The tibial nerve continues down the popliteal fossa coursing lateral to the popliteal vein & artery. All three structures travel deep to the two heads of the gastrocnemius muscle before they enter the tendinous arch of the soleus. Before diving beneath the gastroc, the tibial nerve gives off a small cutaneous branch, the medial sural cutaneous nerve which courses laterally over the lateral head of the gastroc. The common fibular nerve courses laterally after dividing from the sciatic nerve and courses parallel to the distal portion of the biceps femoris muscle towards the fibular head. On route to the fibular head (where it will dive deep between the lateral soleus and the fibularis group before it divides into the superficial and deep fibular nerve), it too gives off a small cutaneous branch, the lateral sural cutaneous nerve. 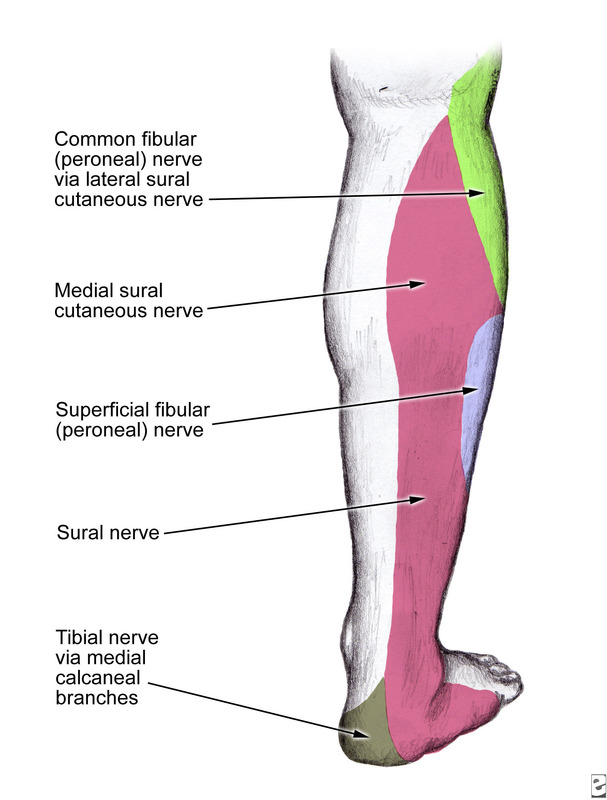 The two cutaneous branches of the sural nerve (medial and lateral) join at the distal third of the gastroc (as they run superficial to it) to form the Sural Nerve. The nerve then continues down the leg on the posterior-lateral side, then posterior to the lateral malleolus where it runs deep to the fibularis tendon sheath and reaches the lateral tuberosity of the fifth toe, where it ramifies. The nerve transmits signal from the posterior lateral corner of the leg, and the lateral foot and 5th toe (see figure 1). Symptoms most commonly associated with irritation of the sural nerve include chronic (because the diagnosis is usually missed for a long time) pain in the posterior aspect of the leg, usually exacerbated with physical exertion. Radiating pain/tingling into the foot may occur distally, which may or may not be accompanied by referred pain proximally in the gastrocs. Clinical examination reveals tenderness with palpation posterior and lateral to the myotendonous junction of the Achilles (at the location of the fibrous arcade). Please note once again that there are NO orthopedic tests for this condition (ie. Improve your palpation…www.FunctionalAnatomySeminars.com). Tinel’s sign, as is usually the case, will most often be negative with this condition. Treatment: As with any nerve irritation syndrome, manual therapists can attempt to decrease frictional irritation in the area with myofascial or Active Release. Whether these techniques work to remove excessive fibrous tissue in the area…or if they simply act to reduce neural edema is up for debate (I will probably blog on this topic soon). If hard neurological signs continue, and the condition is resistant to manual care, surgical release of this nerve is warranted. ← Functional Anatomic Palpation Systems – UPPER LIMB SEMINAR….spaces are running out!!!! My EMG test a year ago revealed my sural nerve was non responsive.I am in pain. Does this nerve impairment cause my neuropathy to be classified as mild, moderate or severe. What is the consequences if not repaired? Would really appreciate any comments or opinions – Please! If the patient continues to have symptoms despite conservative manual therapeutic measures, there are options out there besides surgical release. Consider ultrasound guided injection therapies, including hydrodissection if thought to be secondary to a fibro-muscular/osseous entrapment. Minimally invasive, potentially curative, and at worst a good diagnostic proceedure in difficult cases. Is hydrodissection possible if ganglion is too deep to view in ultrasound? I had peroneal nerve decompression surgery but doc was unable to reach tib/fib cyst without splitting my calf open. Feels more anterior than posterior but bone seems to hide fluid in ultrasound imaging (though clearly visible at posterior tib/fib in MRI). Thanks! What if your pain is bilateral…since both my calf muscles hurt equally and are worse with exercise and in the night/mornings I am thinking it more likely something further up the nerve chain and maybe related to my chronic mid thoracic back pain? This is definitely a possibility Jeff. When pain is bilateral it is important to rule out centrally mediated causes first. Four years ago I rolled my right ankle. I had pain below the ankle bone that over time spread to the cuboid bone. Since then the peroneal insertion points are painful around the cuboid. Then the pain spread to the metatarsal head behind the second toe, which is now reactive and painful–feels like I’m walking on rocks along the bottom right side of foot and feels like I’m tearing something around the cuboid. A year or so ago I rolled the left ankle and the same pattern is developing. I’ve been to four podiatrists (none of whom can figure out what’s going on), I’ve had three MRIS with nothing shown. I’ve had bone scans showing mild arthritis in the ankles. Now my PT is saying I have serial nerve entrapment, but your description doesn’t sound like what I have going on. I used to be an active walker. Now it’s painful to walk across the room. Any ideas? Unfortunately I don’t think I can be of much help unless I can assess you. I can say however that by your description, the problem “sounds” more mechanical than neurological. “Series” entrapment, which I assume to mean some sort of double crush syndrome of the nerve should produce neurological symptoms…however I cannot make any conclusions with just this information unfortunately. It sounds like you damaged your Peroneal Longus tendon. The Sural nerve runs just inferior to this under the tendon. Your rock type feeling is either the neuropathic nerve pain or a compensation of the ball of the foot to remove pressure from the site of the cuboid. Compensation pain is very common. .It sounds like you have a forefoot neuroma. Most likely need an experienced Podiatrist to look at the MRI to assess the Peroneal longus tendon. Thanks for responding to this year-old post. Since writing this in June last year, I saw a fifth podiatrist surgeon in August 2012 who said I had a foot deformity, moderately skewed to outside, and nothing was going to help but surgical reconstruction. Unfortunately, I bought his diagnosis and had foot surgery last September. He did calcaneal osteotomy, “repaired a torn tendon” and “repaired a loose ligament,” and cut the top of the foot behind big toe and put a plate and screws. It’s been a terrible experience. Right lateral pain continues worse than ever and now I have flexor tendon pain, pain across forefoot making it difficult to do normal heel toe movement, which is now creating bone spur or plantar fasciitis, plus ankle and calf pain. I’ve been seeing an acupuncturist who has done deep tissue work as well as ah-shi points (where pain is), and nerve points, etc. I’ve seen Feldencrais movement specialist who says bones are in place, but doesn’t know why I’m in so much pain. Tomorrow I see a DO about prolotherapy. What do you think about prolotherapy? I’ve seen five podiatrists and had two mri’s and x-rays and nerve conduction, etc. No one knows why I’m in so much pain (unable to walk anywhere without deep pain). I recently started stretching my hamstrings by standing on one leg and propping the other leg up by the heel on a table or the back of a chair. During these stretches, if anything touched the ‘fibrous arcade’ area to the outer side of my achilles tendon/ lower calf muscle, I would feel an intense pinching/ ripping sensation in this fibrous arcade area. This happened in both legs, but more noticeably in my left leg. I now have Tinels sign in this fibrous arcade area on my left leg, and the sensation is slightly reduced. I occasionally have an ache in the outside of this ankle. If I tilt the top of my foot towards my shin (stretching the achilles tendon/ calf muscle, perhaps exposing the nerve more) and tap lightly on the fibrous arcade area it causes electric shock tingling in part of the outside of my foot/ ankle area. The electric shock shoots down the nerve for a split second the instant I percuss it, and some mild tingling then persists for a few seconds. I cannot find any sensory loss in my foot. In my normal sporting activities this doesn’t really bother me at all. I noticed it when I scratched the area due to an itch and was disturbed to find that deeply scratching or tapping this certain area on the outer side of my upper achilles tendon instantly triggers these tingles in the outer side of my foot/ lower ankle. I do have another Nerve entrapement affecting my left leg which is Meralgia Paresthetica- a partially numb patch of skin above my left knee, on the outer frontal part of my thigh, which experiences burning and tingling within the numb area when I stretch this leg out behind my body, as you do when you sprint or do a Psoas stretch. Have I got anything to worry about? I had a Spinal MRI done, which showed no abnormalities apart from a ‘widebased left paracentral lumbrosacral prolapse’. With ‘so significant foraminal narrowing’ and the ‘spinal canal is adequate at this level’. This doesn’t seem to cause my any pain, thought I will shortly be recieveing some physiotherapy as a preventitave measure. Of course it would be impossible for me to give you any solid advice regarding your particular case as I have not examined you myself. I will state that very often athletes keep their knee straight when performing hamstring stretches. While this is appropriate for very flexible/mobile people who have specifically trained neural mobility, for most, this places unnecessary stress on the sciatic nerve and its multiple extensions. I therefore suggest you search ‘hamstring stretch’ on my blog and review the proper stretching methods to target the hamstring without tensioning the neural tissues. Thank you for the reply. That certainly seems to ring true. I am 23 years old and have never previously stretched my hamstrings much, so my straight leg raise was woefully poor and I could just barely touch my toes with some unpleasant pulling in the back of my knees. It is now at near 90 degrees and quite comfortable. I had no idea you could tear nerves doing these stretches though! No wonder it hurt a bit for a while! Probably bulged out the disc doing the same kind of thing- over doing something or other a few years ago. Thanks for your advice- I will look for a less intense hamstring stretch. * Also recently had a muscle strength and reflex examination done by a doctor of chiropractic and all was normal. No missing ankle jerk reflexes. Approximately 5 weeks ago after my daily walk (2-4 miles every day no matter how hot or cold it is) I noticed a pain in my right foot, more to the mid-lateral area. I did not walk for 3 days to give it rest and attempted on the 4th to walk but got about 75 yards from home and had to go back. Pain has persisted despite rest (I am walking on it everyday at work, etc). I’ve stopped yard work and have been more of a couch potato. Week ago today I visited my M.D. Xrays revealed no fx but that evening I was blowing off my driveway and felt a pop in the same area. Pain has been even worse 8 to 9 out of a 10, very tender on palpation mid-lateral when pressing or stepping on the side of my foot. Pain radiating into my little toe. M.D. put me on Medrol dose pak and anti-inflammatory but neither have done anything for the pain. Seeing my ortho tomorrow. I had a Morton’s neuroma in this foot (surgically treated) about 10 years ago but this pain is nothing like the neuroma was. I’m stumped and welcome any advice or help or diagnosis. My symptoms seem consistent with trauma associated sural nerve entrapment. I guess my question relates to whether there is a specific test or way to determine if this is the cause of my condition – and options for treatment. Beyond the directly related pain the pain killers are having an adverse effect on my work and personal life. I am frustrated that I can no longer do anything active – including walking any distance – but am getting increasingly frustrated by the lack of any coherant medical opinion – am truely hoping you can assist. yetta, who was the specialist you saw and where? Hi Kim, I live in regional Australia so had to travel 1700km to see Dr Jeffrey Peereboom in Brisbane. I have another consult in February hopefully to schedule the surgery. I had great success at “The Dellon Clinic” in Baltimore, Maryland. I saw, and still see, Dr. Eric Williams. He is a plastic surgeon who does nerve release. I had a horrific case of dimple anatomical variation in my legs that caused extreme and ubiquitous nerve entrapment. I live in Minneapolis, Minnesota, USA but the 6 flights to Baltimore, Maryland USA for multiple surgeries by him did no less than save my life!-the pain was UNBEARABLE. He is an excellent diagnostician, surgeon and all around nice guy!!! Once there I felt like I was surrounded by people who understood my problem and simply nodded their heads in AGREEMENT with me not shaking their heads in disbelief as most physicians at Mayo Clinic did. I was hit in the ankle by a stroller a year and a half ago now. Just went through a radio frequency injection yesterday. I am in a lot of pain right now. This is in the same ankle as an achilles tendon repair about six years ago now. I don’t think the RF worked. Seems like it wasn’t in the right area. I didn’t have pan up my leg until now. The one thing that has been happnening is calf cramps really bad. I need those to go away. Very uncomfortable. Symptoms inlcude ankle pain that runs down the outside of my foot and into the 2 outside toes, severe calf cramps, burning sensation at sight of impact and down to my toes, and the entire foot has the sensation of going cold., In addition, now that the RF was done I have pain and a burning sensation up the outside of my leg. Something has to give and it needs to happen now. For 7 years I’ve had an electric shock sensation over my left lateral heel – only when straight leg-raising together with supination. It is intermittent – lasting a few months at a time then remitting. I can also trigger it by firm pressure over the sural nerve at about the fibrous arcade mentioned here – the nerve feels like a taut guitar string. I have checked HbA1c and excluded every other systemic cause of neuropathy (I’m a practising physician), so I think it must be what you are describing here. However, I have no history of trauma to the area and am not sporty so I wonder what the cause would be. The other strange thing is that it started on the right side (documented in emails at the time), but lately has always been on the left. An MRI showed old Schuerman’s but no nerve root pressure/bulge. Would be grateful for advice – it doesn’t really bother me except that I would be happier knowing the cause for certain – would NCS help? This is a very well written account of a problem that I believe is more common than is assumed, and more importantly, diagnosed. Nerve entrapment, its diagnosis and treatment is highly under diagnosed. Nerve entrapment cab be immensely painful and quite difficult, if not impossible to treat with standard narcotic treatments for pain. I have found ONLY methadone to be effective amongst all the narcotic choices. A TIMELY diagnosing of nerve entrapment and the appropriate surgical release, by a skilled plastic surgeon, can prevent a lifetime of pain and/or debilitation. i stepped into a hole, may have hyperextende right knee. initial pain deep central/lateral behind right knee, maybe popliteus tendon? I now have a tight calf muscle or soleus muscle and pain and burning in lateral heel which i feel could be the sural nerve. Could all these areas relate and what do you suggest I do to relieve the pain. My lateral heel pain and burning is debilitating. forgive my lack of anatomical knowledge. Trying to figure this out. I had a bad bout of PF about 1.5 years ago, had ESWT followed by a cortisone shot, in which the Podiatrist cut into the sole (and inner side) of my foot to make holes in my PF. Since then I have had tremendous pain in my ankles, below my ankles, outer sides of my feet and the top portion of my feet. I’ve tried numerous medications with no relief. I’ve gone for a MRI with no results, my EMG showed peroneal and sural damage, but the Neulogist could not confirm a diagnosis unless I was test 6 months later. I’m still waiting for another EMG, but was wondering if this type of nerve damage can be repaired. With no confirmed diagnosis, the pain is limiting my lifestyle tremendously. I’m left wondering if the initial PF treatment has caused this nerve damage. Any feedback would be appreciated. On Christmas, I had a baby. I was nursing him constantly for the entire three months that I was on maternity leave from work and spent the majority of my days sitting, on the couch, on my left foot! I would occasionally feel a “cramp” in the foot and just change my position, taking my foot out from under me. I continue to feel the cramping in my foot, and it definitely worsens if I do any running at the gym. Even bending my foot to put my sneaker on hurts (touching it hurts!) The pain seems that it is centered on the outside of my foot and comes in a little bit to the bottom of the foot just below the small toe. I saw a specialist a few days ago and she told me that I agitated the sural nerve and that i should stop putting pressure on it (like not to sit on it anymore). She suggested that it should repair itself in about a year as long as I don’t continue to irritate it. She also said that she could provide quicker repair with a steroid injection, which I refused for the present time. I saw her because I wanted to see if this was something that would repair itself and just knowing that it will, I am relieved. In the meantime, any suggestions? I am trying to be more consious now about crossing my feet and my position when at work and sitting down. Sometimes, the pain is too much-not unbearable, just really bothersome and sometimes causes me to limp! Sometimes, I feel it at night while sleeping. Is there a good medicine specifically for nerve pain like Tylenol or Aleve or something like that (for the bad bouts)? I felt like I had to share this…was wondering if it has happened to anyone else? also, what if i had something wrong with the nerve to begin with and this just set it off and didn’t really cause it? My issue has been prolonged for over two years now. My background is a distance runner, who was running around 100 miles a week for a good few years, until I developed bilateral pain in my heels, and was diagnosed with insertional achilles tendonopathy. I have been through that many different types of rehab I cant even remember them all, no surgical interventions, but PRP, cortisone, NSAIDS, naproxen, you name it. It appears to be an inflammatory problem given that if I stop running for a few days, the swelling goes down and the pain at the insertion goes away, even with naproxen. I read this blog and was wondering if it is possible my issue is a neural one, and is it worth asking my specialist about?